Interested in the best examples of using social media as a recruitment strategy? In this blog post, we will present 7 best examples of big brands using social media to leverage their recruitment efforts. Let them inspire you to create your own social media recruitment strategy! Using social media networks (such as Facebook, Twitter, LinkedIn and Instagram) to recruit is one of the latest recruiting trends. As social media has exploded in the past decade, candidates are using it more and more for job research. According to LinkedIn, nearly half of all professionals (49%) are following companies on social media with the intent to stay aware of their jobs. Luckily for employers, using social media is an easy, free and highly effective way to advance your recruitment efforts. How can social media advance your recruitment strategy? The No.1 reason employers engage in recruiting on social media channels is to attract potential candidates not yet looking for a new job, according to new research from the Society for Human Resource Management (SHRM). Using social media can help you find, attract and engage potential candidates. If you learn how to effectively promote your employer brand on social media, you will easily turn your potential candidates into applicants. How to do it? Learn from big brands! Using social media as a recruitment strategy is very popular among big brands. Under Armour, Inc. is an American company that manufactures footwear, sports, and casual apparel. This company has created a specialized Twitter company profile dedicated solely to recruiting! Create a separate company profile on social media for recruiting purposes. Usually companies name these profiles as “[Name of the company] Jobs” or “[Name of the company] Careers”. This requires some extra time and effort; however, it is a best practice because it allows you to clearly target your audience as candidates, not as customers. Zappos.com is an online shoe and clothing retailer based in Las Vegas, Nevada. This company excels at using social media as a recruitment strategy! Take a look at the example below: Their Facebook post that announces their Summer Internship. Adjust your social media communication to specific social media network you are using as a part of your recruitment strategy. If you are using Facebook, use interesting photos or infographic to stand out. If you are using Twitter, utilize short messages and hashtags, etc. Taco Bell is an American chain of fast food restaurants based out of Irvine, California and a subsidiary of Yum! Brands, Inc. This company is another example of big brands that take the recruitment strategy to another level using social media. Take a look at the invitation for their recruitment event published on Facebook! Don’t be afraid to show off your informal and fun side on appropriate social media networks, such as Facebook. Learn from Taco Bell, the company that turned nerve wrecking process of job interview into fun festivities called Hiring parties. This way, they are able to attract more interested job seekers and differentiate their employer brand! The Home Depot is an American home improvement supplies retailing company that sells tools, construction products, and services. This company does a great job at showcasing their company culture across their social media profiles. Take a look at how they target their summer interns in their Facebook post shown below. Social media is a great place to showcase your company culture! You can use it to share your company values, vision and mission. And don’t forget to make it more interesting and visually appealing by adding photos of everyday life at your office and your employees! Dell is an American multinational computer technology company based in Round Rock, Texas, United States, that develops, sells, repairs, and supports computers and related products and services. Dell is one of the company that champions using social media as a recruitment strategy. They are famous for featuring their employees. Check out how they do it in the example below. Your existing employees are your best employer brand ambassadors. Feature their photos, stories and quotes on social media to give your employer brand a human face. That will help your potential employees to connect with your employer brand on an emotional level. Lush is a cosmetics retailer selling natural hair and beauty products headquartered in United Kingdom. This company has a very vivid, engaging presence on social media. They are especially creative with advertising their open job positions. Check out the example below! Make sure that you breathe in some life and spirit into your social media advertising of your open job positions. Don’t just copy paste boring, formal job descriptions. Instead, post a fun and creative introduction to your job openings. Make it sound interesting! And of course, don’t forget to post visually attractive photo of a team that the candidates applying will be a part of if the get hired. Salesforce is an American cloud computing company headquartered in San Francisco, California, whose revenue comes from a customer relationship management (CRM) product. Salesforce has a great Instagram company account dedicated entirely to promoting life inside Salesforce. Check out how they highlighted being awarded the Best Places to Work trophy! Show, don’t (just) tell! Let your potential candidates see why your company is a great place to work. Give them a reason to apply for an open position at your company, instead of choosing some other company as their employer of choice. Make sure that you don’t just post a photo of your trophy! Make sure you include real people - your existing employees - proudly gathered to celebrating your company being named as the best place to work! Start using social media as a recruitment strategy now! Hopefully these best examples of using social media as a recruitment strategy from big brands have inspired you to start using social media to advance your own recruitment efforts. 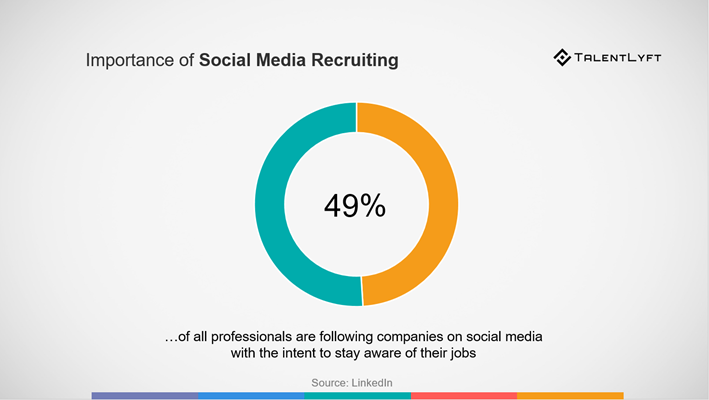 Using social media in recruitment is one of the recent trends in recruitment. If you want to gain competitive advantage over other companies and join these big brands, you better hurry up and start using social media as a recruitment strategy right now!